According to the National Association of Sports Commissions, estimated visitor spending associated with sports events was over $10.47 Billion in 2016. Advertisers naturally want to align themselves with the sheer volume of fans and the energy they bring to a host city. Brands with big budgets become an official sponsor, while others choose to place media in hot spots surrounding the sporting event. 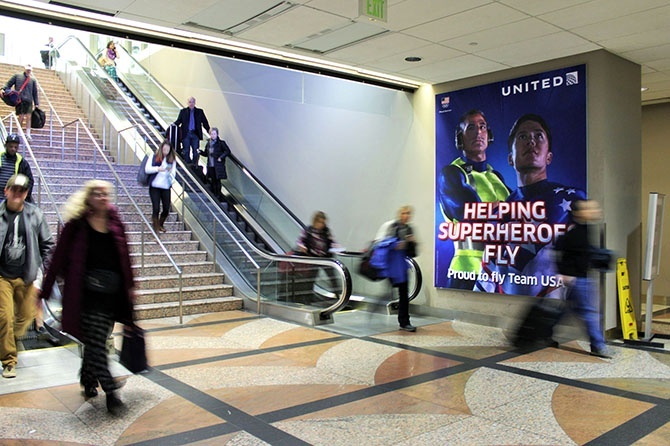 Airport advertising covers both marketing strategies and has a first impression advantage -- reaching travelers as soon as they land. 88% of Air travelers spend 30+ minutes walking the concourse, making it an opportune time to connect. 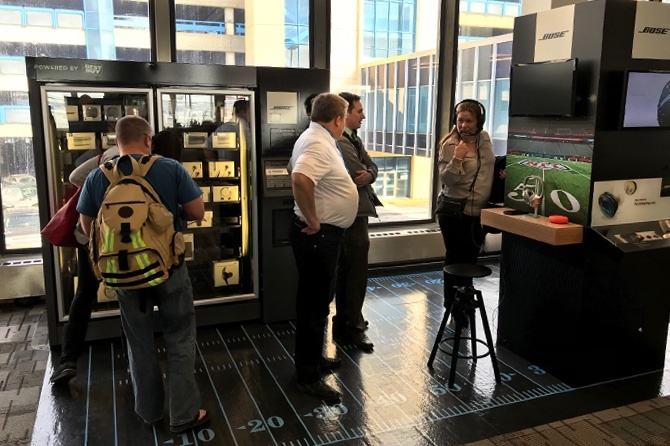 With messaging that guides them through their arrival, from super-sized LED displays to interactive kiosks to sampling, this location-based media reaches all touch points. Here are two examples that illustrate how brands upped their out-of-home game. 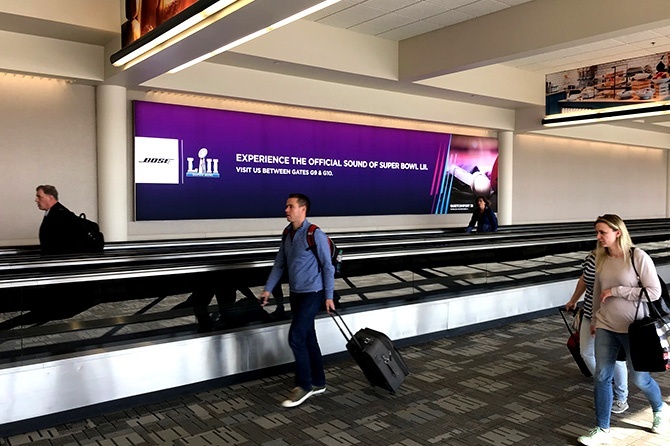 In anticipation of one of the most celebrated sports events of the year - the Super Bowl, Bose wanted to promote their NFL partnership and get fans pumped from the moment they landed at Minneapolis-Saint Paul Airport. 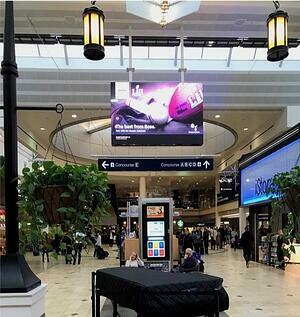 Strategically placed ads throughout the airport directed consumers to an interactive exhibit where they could demo products and make purchases through a Best Buy Express Kiosk. Fans took photos posing with a replica of a coach's noise-cancelling headset to get the vibe and share on social media. Results: MSP more than doubled its daily passengers on game day - boosting a record number of 69,000 flyers. This traffic surge also lead to a surge in headphone sales for Bose in the MN market. As the presenting sponsor of the FIS World Alpine Ski Championships, Audi wanted to engage the ski community converging on Vail and Beaver Creek for the competition. 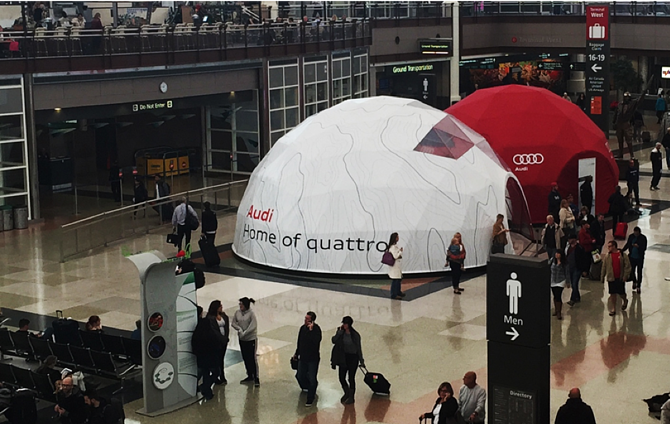 They brought the story of Quattro to life by tying it to the ski experience, installing two giant geodesic domes -- one that served as a hospitality lounge that connected to a second, where travelers could experience a five-minute virtual drive behind the wheel of an Audi S3. Results: This 16-week experience, which took place in Denver International's Great Hall drove approximately 38,000 travelers to the domes. Audi collected over 5,500 qualified leads! Want to target consumers on the move? Airport advertising is a proven way to reach them. Nielsen's latest insights study confirms 80% notice airport ads, 42% take action & 19% purchase a product advertised. 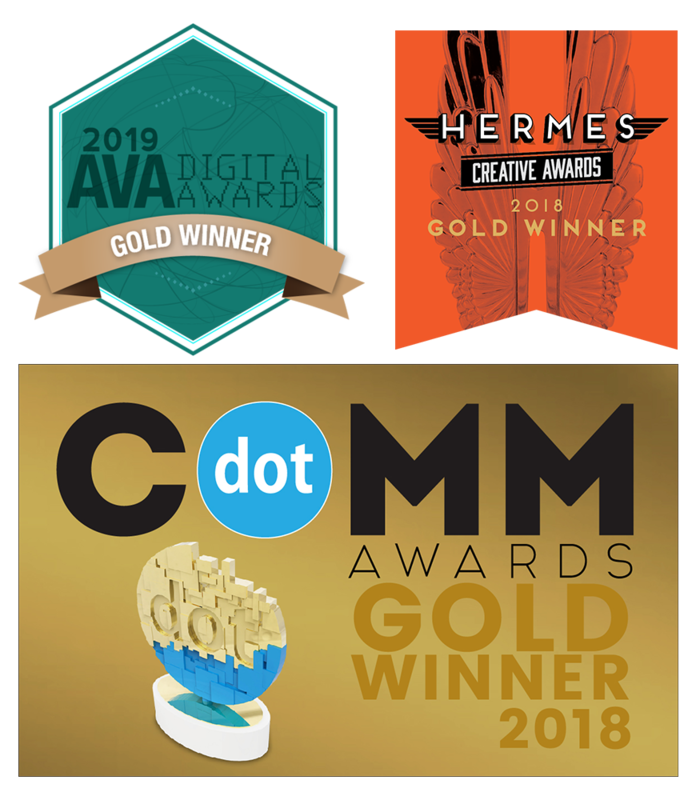 Clear Channel Airports is the premier innovator of contemporary display concepts with digital, experiential, print and mobile advertising display formats. We operate more than 275 airport programs across the globe and has a presence in 29 of the top 50 U.S. markets with major airports delivering over one billion annual passengers.